Now let’s look at the digital marketing funnel. The goal of digital marketing is to take targeted traffic from the digital world and direct it to your site’s pages. And the goal of digital marketing is to capture leads from that traffic and then to convert that traffic. 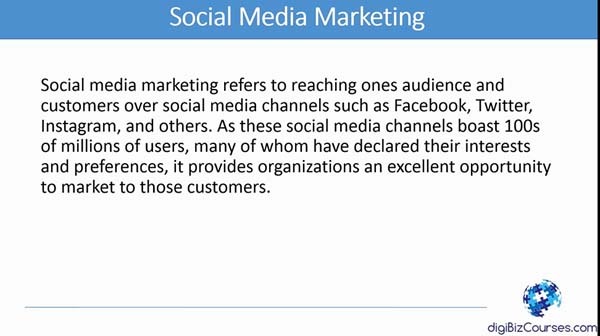 There are other names of digital marketing. This is also referred to as internet marketing, online marketing, digital advertising, online advertising and internet advertising. Now we will look at success in the digital marketing world. What does success really look like. 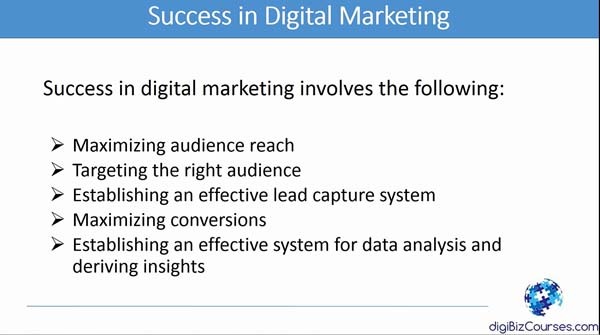 Success in digital marketing involves the following: maximising audience reach, targeting the right audience, establishing an effective lead capture system. Essentially once you’ve targeted a certain audience and once you’re getting traffic you have to have a good lead capture system to capture the right leads. Once you have the right leads, you have to maximise conversions. And finally, you have to have an effective system for data analysis and driving insights. This last point is really important because the first few points that we mentioned are not easily achievable. It only comes in while looking at your data, at your marketing data, at your campaigns data and tweaking that until you get the right audience and until you are getting the right leads and capturing conversions. 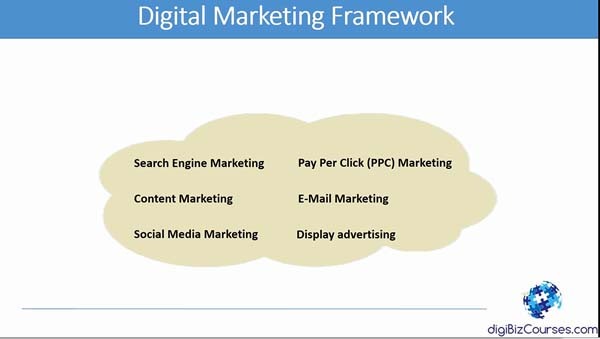 Now we will look at the overall digital marketing framework. Every time we mention digital marketing, it refers to a number of things. It refers to something called search engine marketing, it refers to pay per click marketing, content marketing, content marketing, email marketing, social media marketing and display advertising. So let’s look at each one of those separately. 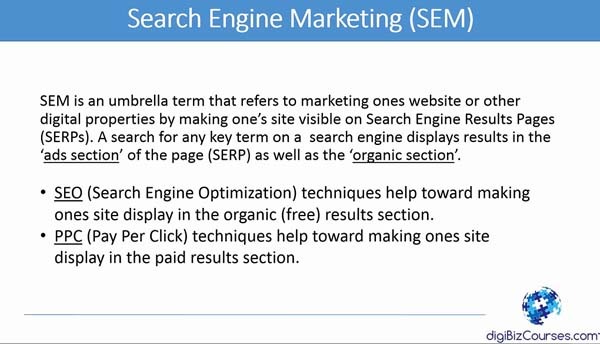 Let’s first look at search engine marketing, which is really an umbrella term that refers to marketing one’s website or other digital properties by making one site visible on search engine results pages which are also SERPS. The search engine key terms in a search engine displays results in the ads section of the page as well as the organic section. Again, when you search, the top section usually has the ads and the middle portion is the organic or the free sections and the bottom part usually has the ads. SEO, which is part of search engine marketing, refers to search engine optimisation. These techniques help towards making one site display in the organic section. So if your site is SEO optimised, Google or other search engines would place your site higher in the organic free results section. 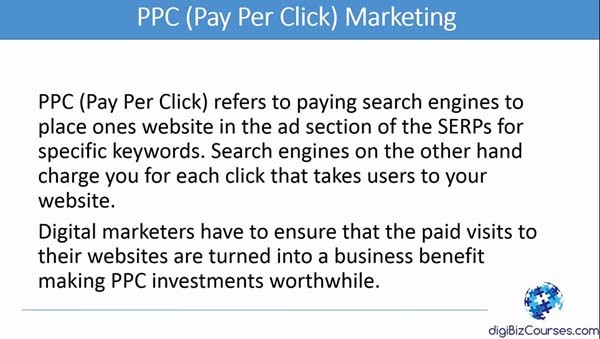 PPC on the other hands, pay-per-click, refers to techniques help towards making one site display in the paid results section. So if your site is not doing well in the organic section and you want to be shown in the top few ranks, you could pay for each clicks and have the search engine place you in those results. Let’s look at search engine optimization now. SEO is the process of optimising your digital property such a as a website, blog, etcetera. So it can be found on search engines by the users when they perform searches relevant to the content that your digital property has to offer. So if you have a website on golf and people and people search for a term say “learn golf”. If your site if SEO optimised for that term, your site would probably show higher up in the rankings on the website on the search engine. What does an SEO optimised site look like? It means if your site is SEO optimised, it means you will get higher organic or natural rankings and search engines, that would lead to more free traffic from search engines and then that can lead you to get more business leads. And then you can convert those leads into conversions. 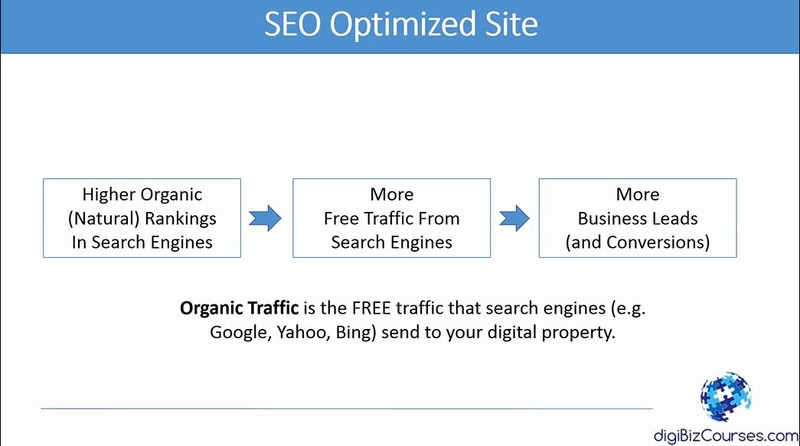 Again, organic traffic is the free traffic that search engines such as Google, Yahoo, Bing sent to your digital property. 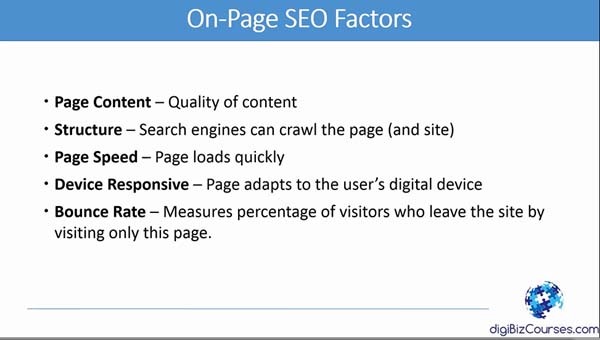 To optimize a site for SEO, there are the on-page SEO factors and then the off-page SEO factors. Let’s look at first the on-page SEO factors. One of the on-page SEO factors has to do with page content, which is the quality content that your page displays. The second one is structure. Search engines again, they crawl the web pages and they analyse the site and based on what they see on the site, they rank it accordingly. So, the structure of your site is very important. Page speed is very important these days. Search engines want to make sure that your page is not loaded with a lot of extra elements preventing quick loads. They want to provide users a good experience so they want to make sure your page loads quickly. Device responsiveness. Search engines want to make sure that your page adapts to the users’ digital device. so, if they use a desktop you will see a nice page or if the user has a mobile phone, they want to make sure it adapts to the device’s screen. Bounce rate is another important measure. It measures the percentage of visitors who leave the site by visiting only the specific page. So, if a person comes into your page and leaves immediately, it means they were not interested in the content of the page. Search engines consider this fact, so the lower the bounce rate, the better your site would rank or that page would rank with search engines. Next let’s look at some off-page SEO factors, one form is internal links structure. This refers to links pointing internally within the site. The external links refer to links which point to your site from other sites. So, the more popular your site is, the more external links you are going to get from other sites. Neighborhood is the factor that search engines look at as they measure the quality of the page. They want to make sure that the links that you are getting is not bad. So it doesn’t come from bad neighborhoods. Social status refers to how active your site is on social networks. There are many SEO related topics, which has to be considered before you are optimizing your SEO. One is a site-headline description, content freshness, image related SEO, SEO related to other content types such as audio, video etcetera, mobile search, local search, word stuffing, duplicate content, search engine robots and SEO, search engine penalties, ink bombs, search engine differences, doorway pages, link building and more. 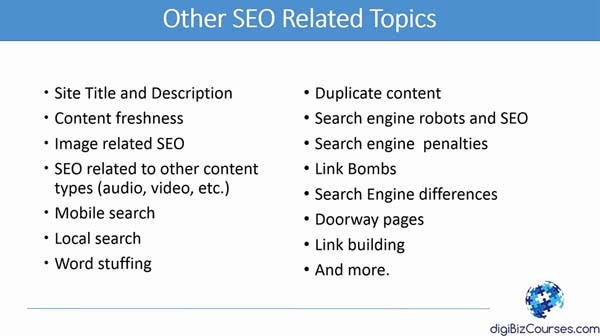 So all these topics actually relate to optimizing your site for SEO. Your system internally should have a system or processes in places to makes sure that every time they roll out a digital page or property, that it is digitally optimised, that it is looking for these factors and to optimise these factors before they actually release the site to the public. Next, we will talk about PPC or pay per click marketing. PPC refers to paying search engines to place one’s websites in the ad section of the SERPS for specific keywords. Search engines on the other hand, charge you for each click that takes users to your website. Digital marketers have to ensure that the paid visits to their websites turn into a business benefit, making PPC investments worthwhile. 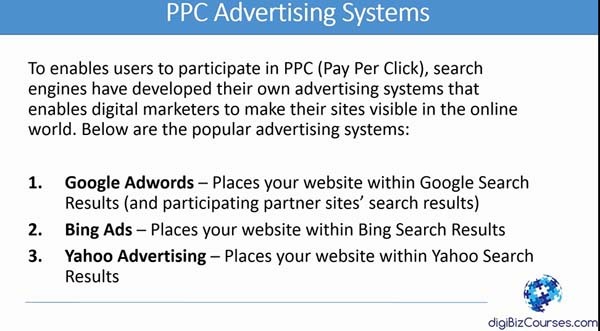 PPC advertising systems. To enable users to participate in PPC, search engines have developed their own advertising systems that enables digital marketers to make their sites visible in the online world. Below are the popular advertising systems. Google Adwords places your website within Google Search results and participating partner sites’ search results. Bing ads places your websites within Bing search results. Yahoo advertising places your website within Yahoo search results. Content marketing refers to reaching out to an organisation’s audience by creating captivating content and distributing it over the internet for global consumption. The underlying principle behind content marketing is that great content will drive internet users to your website. Content marketing involves the following: Content creation, which referring to creating content specific to an organisation’s message to its audience. Content publication refers to publishing the created content on specific digital properties such as the organisation’s websites, blogs, YouTube channels etcetera. Content distribution refers to distributing content to the digital world using SEO, PPC, and other digital marketing techniques. Next, we will talk about email marketing. Email marketing refers to reaching one’s customers and audience through email messaging. Email marketing is used for the following: offer promotions to customers, invite recipients to visit the organisation’s website, communicate a message on behalf of the organisation, enhance and organisation’s relationship with its audience etcetera. Social media marketing refers to reaching out to ones’ audience and customers over social media channels such as Facebook, Twitter, Instagram, and others as these social media channels have millions of users, many of whom have declared their interests and preferences, it provides organisations an excellent opportunity to market to those customers. Finally, display advertising refers to advertising on websites, blogs and other digital properties. In most cases, advertisers usually pay for this method based on the number of impressions that an ad has on a website. Advertisers pay for such advertising either to the websites that they advertise on directly or through Display Advertising systems such as Google Adwords Display, Facebook and other.